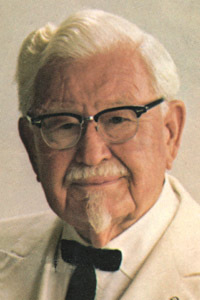 American businessman, and founder of the Kentucky Fried Chicken restaurant franchise, Harland David Sanders started the business in 1952 and sold it in 1964, although he remained their corporate spokesman until his death. Governor Ruby Laffoon made him a Kentucky Colonel in 1935 in recognition of his contributions to the states cuisine. And in 1939, his establishment was first listed in Duncan Hines' "Adventures in Good Eating." Source: card file of the Grand Lodge of Kentucky, F&AM. His gravestone displays the masonic square and compasses, Shriners and Scottish Rite logos. 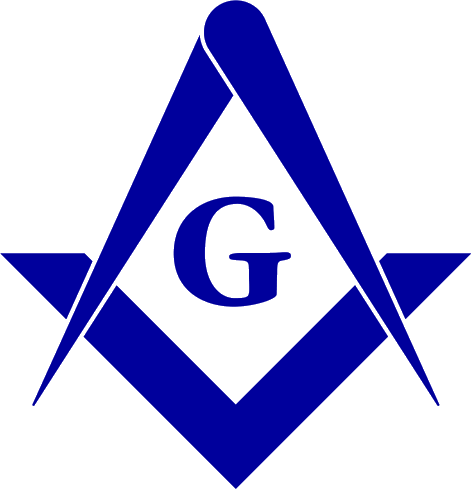 His autobiography, Life As I Have Known It Has Been Finger Lickin' Good (Carol Stream, Illinois : Creation House, 1974 p. 29), notes his installation as a 33° Scottish Rite freemason in Washington, D.C..